Gripping the upper perch, in positions assumed in display, are the BELGIAN FANCY (left), with head and neck extended at a sharp angle from the body, and the SCOTCH FANCY, with a smoothly arched exhibition posture. A “mop” of large, flat feathers adorns the crown of the CRESTED CANARY (lower left). 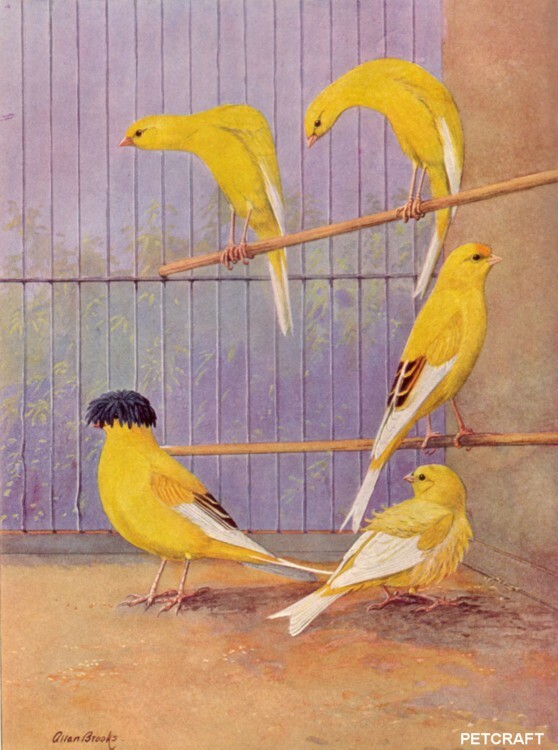 Unusually long, wavy, and recurved plumage gives the FRILLED CANARY (lower right) the appearance of having been stroked the wrong way. Dandy of the English canaries, the YORKSHIRE (right center) should be slim, long, and straight as a soldier. Among the most curious of canary breeds are the Belgian fancy and the Scotch fancy. which are reared entirely for form without regard to song. Both of these are long, slender-bodied birds with small head and are of a highly nervous temperament In ordinary pose there is nothing about them to attract particular attention, but when excited they assume peculiar, almost grotesque attitudes. In the Belgian fancy the bird stands with the body fully erect on its long, slender legs, with the wings pressed tightly to the sides and the long neck extended almost at a right angle to the body. In full position the bill is pointed down. The Scotch fancy exhibits a variation, in that the tip of the tail is thrust forward and the neck arched so that the line from the head to the end of the tail is a smoothly rounded curve. The bird appears to lean backward from its perch in attaining this peculiar position.